November 2018 update: Added interactive Google map of all bridges. The bridges of Columbia Country are not nearly as romantic as the bridges of Madison County, and there is no romantic plot to give their story a heartthrob element. But there is a certain intrigue of history and place in the 48 Columbia crossings between Astoria, Oregon, and Fairmont, British Columbia, if only for their impressive size, large or small, and their often dramatic settings. There are 24 crossings — 21 bridges and three ferries — of the Columbia in the United States, and, coincidentally, the identical number in British Columbia — 21 bridges and three ferries. Not all of the bridges in British Columbia are open to the public, however, as some are operated by the provincial Ministry of Forestry. Those bridges, and also all railroad bridges, are not included in the following list. The list also does not include roadways over dams, such as those at Grand Coulee, Keenleyside and several others. Some of these are open to the public and some are not. Most of the bridges over the Columbia were built at or near the sites of ferry crossings. Ferries provided the only means of crossing the river from the mid 1800s until the first bridges were constructed. The first Columbia River bridges were built in the late 1800s, both in British Columbia and in the United States. A railroad bridge at Pasco was completed in December 1887 and quickly damaged by ice. It reopened in April 1888 as a temporary structure and then permanently in July. Its completion meant that transcontinental passenger trains no longer had to ferry across the river. A railroad bridge was completed at Northport, Washington, eight miles south of the international border, in October 1897. This was the first general-purpose bridge, as it also was used by wagons, foot passengers, and to cross livestock. The first bridge to carry a state highway across the Columbia was completed at Wenatchee in 1908. That bridge, at first privately owned, carried state Highway 2, the Sunset Highway. It was used by autos, wagons, and pedestrians — but no railroad — and also had two irrigation pipelines on its sides. Ferries generally were cost-effective and conveniently located, but over time they couldn’t handle the increasing vehicle traffic of the growing Northwest population. Authors Robert H. Ruby and John A. Brown have enumerated a total of 93 Columbia River ferry crossings between Astoria and the Canadian border, but today there are only three ferries left in regular service in the United States portion of the river. One crosses the lower Columbia River and two cross Lake Roosevelt above Grand Coulee Dam. In British Columbia, there are three ferries in regular service across the Arrow Lakes, which are the Columbia River between Castlegar and Revelstoke. Each ferry is considered a part of the provincial highway system, and so in that sense they are “bridges” and are included here. Astoria-Megler: The first bridge inland from the ocean is arguably the most dramatic and picturesque. The bridge between Astoria, Oregon, and Megler, Washington, which is little more than a landing spot for the bridge, is 4.1 miles (6.56 kilometers) long. Completed in 1966, it carries U.S. Highway 101 over the Columbia River estuary. On the Oregon shore the bridge sweeps dramatically up and away from the western end of Astoria and rises steadily in an arching span 1,232 feet (375 meters) long with 1,070 feet (326 meters) of clearance for river traffic between the two main piers. At its highest point the bridge deck is 205 feet (62 meters) over the water — plenty of room for the hundreds of ocean-going cargo ships that pass by every year. The bridge had a toll until 1993. Westport/Cathlamet: Washington Highway 4 crosses the Columbia River between Cathlamet, Washington, and Westport, Oregon, 26 miles east of Astoria. The crossing utilizes both a bridge and a ferry. The bridge connects Cathlamet with Puget Island, and the ferry, operated by Wahkiakum County, Washington, connects Puget Island with Westport. The first ferry connected Puget Island with Cathlamet and Westport in June 1925, and a second ferry was added to the service later that year. The ferries were privately owned. The bridge was built in 1938. Wahkiakum County took over the ferry service in 1960. Fees are charged for crossing except when the Lewis and Clark Bridge at Longview is closed. Then the crossing is free. Lewis and Clark Bridge: The two-lane Lewis and Clark Bridge, completed in 1930, carries Washington State Route 433 between Longview, Washington, and Rainier, Oregon. The location is about 50 miles (80 kilometers) downstream from the Portland/Vancouver area. Designed by Joseph Strauss, who also designed the Golden Gate Bridge, the Lewis and Clark Bridge is 5,478 feet (1,669 meters) long and has a vertical clearance for river traffic of 196 feet 60 meters). The horizontal clearance for river traffic is 1,200 feet (366 meters). The bridge carried a toll until 1955. Interstate Bridge: This bridge — actually two steel-truss and concrete bridges — carries Interstate 5 between Vancouver, Washington, and Portland, Oregon. One bridge carries three southbound lanes and the other carries three northbound lanes. This is the busiest of the Columbia River crossings, with well over 100,000 vehicles per day. The original bridge, which today is the northbound structure, was completed in 1917 and was the first bridge to connect Washington and Oregon across the Columbia. The second span, which today carries the southbound lanes, was completed in 1958. The original structure carried a toll until 1928, and tolls again were collected between 1960 and 1966 to pay for the second structure. Both structures are steel. There are twin steel lift spans near the Washington shore. The bridges are 3,528 feet (1,075 meters) long. The river level fluctuates with tides, but the normal clearance over water is 72 feet (22 meters) at the middle of the bridge and 38 feet (11.5 meters) under each lift span when closed, 174 feet (55 meters) maximum when open. The lift spans provide 270 feet (82 meters) of horizontal clearance for river traffic. The bridge is owned by Oregon; operation costs are split equally with Washington. Glenn Jackson Bridge: The Glenn Jackson Bridge, six miles (9 kilometers) upstream from the Interstate Bridge, carries Interstate 205 between Vancouver and Portland and is nearly as busy as the Interstate Bridge. Unlike the steel Interstate Bridge, the Glenn Jackson Bridge is a post-tensioned box girder design with a concrete slab roadway. There is no lift span. The bridge touches down on Government Island near the middle of the river, dividing the bridge into a north span and a south span. The north span is 7,434 feet (2,266 meters) long, and the south span is 3,165 feet (964 meters) long. The island portion is 1,161 feet (354 meters). The total length is 11,760 feet (3,584 meters). There are four lanes southbound and four northbound. The bridge is owned by Oregon, and Oregon maintains the south channel crossing and the island crossing. Costs for the north channel crossing are shared by the two states. Bridge of the Gods: The two-lane, steel Bridge of the Gods crosses the Columbia at River Mile 148 about 40 miles upriver from Portland. The bridge is at the site of a great landslide that occurred around the year 1700 or perhaps as many as 700 years earlier. The 14-square mile (22.4 square kilometer) landslide dammed the Columbia River in the area of the bridge, at Cascade Locks, Oregon, and across the river at Stevenson, Washington. The slide occurred when Table Mountain on the Washington shore gave way, probably in an earthquake. The Cascade Landslide pushed the river channel south a mile, a feature still plainly evident from the air. In myth, at least, the river undermined the landslide and created a natural bridge — the Bridge of the Gods — but modern ethnologists say the local Indian dialect did not have a word for “bridge” and that the story is probably a fiction. The geologic record shows that water backed up behind the landslide for about 200 miles (320 kilometers). Eventually, the river forced its way through the landslide and distributed rocks and debris downstream for a distance of several miles, creating the falls of the Cascades. Today, the Bridge of the Gods, more than 1,800 feet (549 meters) long, spans the river in the area of the landslide, connecting Cascade Locks with a point on the Washington shore about three miles (4.8 kilometers) west of the city of Stevenson. Named for its mythical ancestor, the modern Bridge of the Gods was completed in 1926. Later it was raised 44 feet (13.4 meters) and lengthened by about 700 feet (213 meters) to make way for the higher water level behind Bonneville Dam, which was completed in 1938 five miles (8 kilometers) downstream. For decades the bridge was privately owned. The Port of Cascade Locks bought it in 1961 and operates it to this day, collecting a toll for crossing. Hood River Bridge: This two-lane bridge, at River Mile 169.8, carries Oregon’s State Route 35 over the Columbia from the city of Hood River to an intersection with Washington Highway 14 a short distance west of the town of Bingen. Built in 1924, the bridge is made of steel with a steel grate deck, like the Bridge of the Gods, and is 4,418 feet (1,346 meters) long. It uses 20 piers to span the river. In 1937, as Bonneville Dam was nearing completion downstream, a vertical lift span was added to accommodate the anticipated increase in river vessel traffic. The lift span is between piers 8 and 9 near the center of the bridge. The horizontal clearance is 246 feet (75 meters), and the vertical clearance is 148 feet (45 meters) when fully open and 67 feet (20 meters) when closed (assuming the normal reservoir elevation behind Bonneville Dam of 73 feet (22 meters) above sea level. Full pool is 77 feet (23 meters). The bridge is owned and operated by the Port of Hood River, which collects a toll for crossing. The Dalles Bridge: Completed in 1954, The Dalles Bridge connects The Dalles, Oregon, with Murdock and Dallesport, Washington, via U.S. Route 197. The location is about 90 miles (144 kilometers) east of the Portland/Vancouver area. The steel beam and steel truss, two-lane bridge is 3,342 feet (1,018 meters) long and is 81 feet (24 meters) above the river at its highest point. Biggs Rapids Bridge: Also known as the Sam Hill Memorial Bridge, this single-span, steel truss structure connects Biggs, Oregon, with Goldendale, Washington, via U.S. Route 97 approximately 100 miles (62 kilometers) east of the Portland/Vancouver area. The two-lane bridge, completed in 1962, is 2,567 feet (782 meters) long. There is no lift span and no toll. The bridge is owned by Washington state. The vertical clearance for river traffic is 75 feet (23 meters) under normal water levels in the pool behind The Dalles Dam, and there is 300 feet (91 meters) of horizontal clearance between bridge piers. 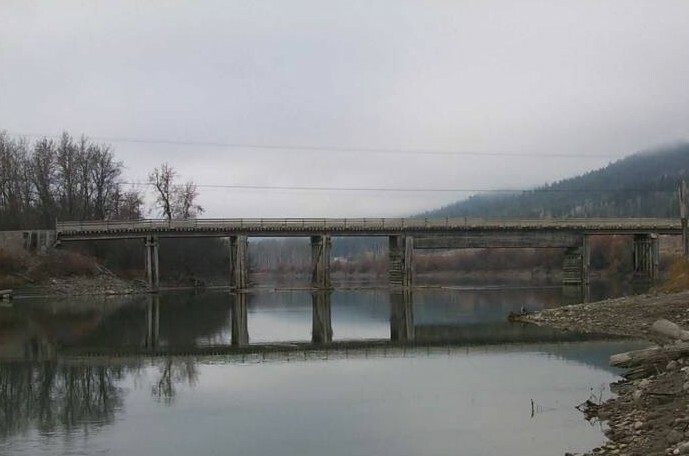 Umatilla Bridge: The Umatilla Bridge, originally completed in 1958 and expanded in 1988, carries Interstate 82 between Umatilla, Oregon and the Washington shore of the Columbia, where the nearest community is the town of Plymouth just west of the bridge on Washington Highway 14. The bridge is owned by Washington state. There is no lift span and no toll. The location is about 175 miles (280 kilometers) east of the Portland/Vancouver area a short distance downstream from McNary Dam. Like the Interstate and Glenn Jackson bridges, the Umatilla Bridge is really two bridges. The original bridge, completed in 1958, today carries the two southbound lanes, and the newer structure, completed in 1988, carries the two northbound lanes. The original bridge is 3,380 feet (1,030 meters) long and 85 feet (26 meters) over the water with 335 feet (102 meters) of horizontal clearance for river traffic; the newer bridge is 3,433 feet (1,046 meters) long and 80 feet (24 meters) over the water, with 400 feet (122 meters) of horizontal clearance. U.S. 395, the “Blue Bridge”: One of two bridges that connect Pasco and Kennewick, Washington, the Blue Bridge also is known as the Pioneer Memorial Bridge. It opened in 1956. Washington State Route 397 bridge: Known as the “Cable Bridge” and formally as the Ed Hendler Memorial Bridge, this bridge opened in September 1968. This bridge, which also connects Pasco and Kennewick, replaced the original Highway 12 bridge, also known fondly as the “Green Bridge” because of its color, which opened to traffic in October 1922. The Green Bridge, the first to cross the Columbia in the Tri-Cities (Pasco, Kennewick, and Richland) area, carried a 10-cent toll .Importantly, the bridge linked southeastern Washington with central and western Washington along a national highway known as the Yellowstone Trail, which later became U.S. Highway 410 and, still later, Washington Highway 12. The Green Bridge was 2,113 feet (644 meters) long and, at its highest point, 52.3 feet (16 meters) above the water. It was closed in 1968 and later demolished — all but a 16-foot section that was preserved and put on display outside the East Benton County Museum in Pasco. Interstate 182 bridges: These twin bridges, also known as the Sam Volpentest Memorial Bridges, carry four-lane I-182 across the Columbia west of the Tri Cities, linking those communities with Yakima and Interstate 90 west of Ellensburg. 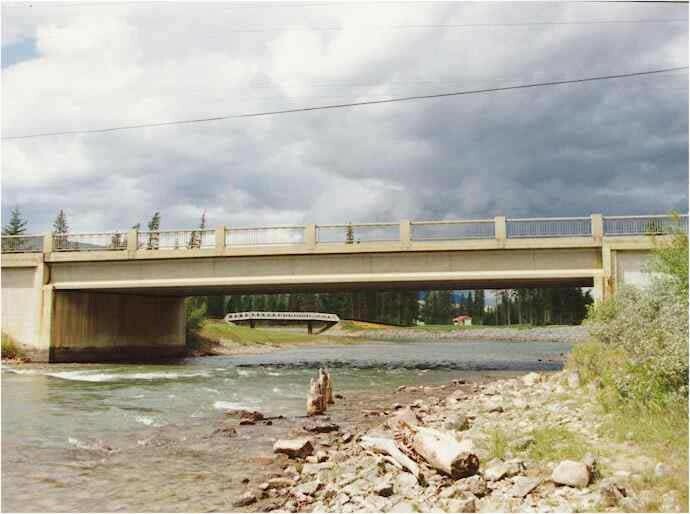 Vernita: The Vernita Bridge opened to traffic in 1965, replacing a ferry that had operated upstream in the Priest Rapids area. The bridge carries State Route 24. Vantage/I-90: The bridge that carries Interstate 90 across the Columbia in central Washington dates to 1927, when the original bridge was completed at the site of a historic ferry crossing a mile upstream from the current structure. Congress authorized Grant and Kittitas counties in 1924 to construct a toll bridge at Vantage. The counties transferred the permit to a private company to build the bridge. A battle over authority ensued, but the state won and built the bridge. The construction of Wanapum Dam in the late 1950s forced relocation of the bridge, as the dam eventually would raise the river level. Construction at the current location began in 1961. The 2,504-foot-long (763-meter) bridge opened in November 1962. Wenatchee: Two bridges span the river at Wenatchee, which has a special distinction in the history of Columbia crossings. The first automobile vehicle bridge across the Columbia River was completed there in 1908. It was a steel bridge with a wooden plank deck, and it was built to accommodate horses and wagons. Wagon traffic actually was a secondary use of the bridge, which was built primarily to carry water of the Highline Canal across the Columbia from west to east. Built by a private company, the bridge did not have a toll, at first. But within a year of its opening, its owners threatened to add tolls, and in 1909 the state of Washington bought the bridge for $125,000 in order to keep it toll-free. The bridge was narrow and, over time, became a traffic bottleneck. Construction began on a new bridge a short distance downriver in 1948 and was completed in 1950. Today, this bridge carries Washington Highway 28/285 (Stevens Street) across the Columbia, connecting Wenatchee to its suburb of East Wenatchee. At the north end of the city, another bridge carries U.S. Highway 2 across the river. This bridge is on the site of the Burch ferry, which began operating in 1884. The current bridge was completed in 1974. Beebe Bridge: This bridge, near the mouth of the Chelan River about 40 miles upriver from Wenatchee, originally was constructed to carry an irrigation pipeline across the river to property owned by the Beebe Orchard Company of Boston. The bridge opened to the public as a toll bridge in 1919, replacing a ferry. The Washington Department of Highways built a new bridge immediately to the north of the old one. The new bridge, which carries Highway 97, was completed in 1963. Brewster: The first bridge at Brewster, completed in 1928, was privately built and had a toll. Eventually it was purchased by the Washington Department of Highways, which raised it 7.5 feet (2.5 meters) in 1966 to make way for the rising water behind Wells Dam downstream. In 1968, the bridge deck caught fire near the center of the span. The damage was so extensive that a section of the bridge collapsed, and a new bridge had to be built. The new bridge, constructed on the piers of the original one, opened in 1970. Bridgeport: The bridge at Bridgeport, a town on the south bank of the river named by railroad surveyors for their home city in Connecticut, crosses the river at the site of a ferry, which the bridge replaced. That service ended abruptly in 1929 when the ferry was destroyed by ice, and for 21 years Bridgeport residents crossed the river on the Brewster bridge about 10 miles downriver. The bridge at Bridgeport, which carries Washington Highway 17, was completed in 1950 and is located just downriver from Chief Joseph Dam. Coulee Dam: Washington Highway 155 crosses the Columbia on a steel bridge in the city of Coulee Dam just downstream from Grand Coulee Dam. The dam is located at the approximate location of a ferry that was operated by a man named Sam Seatton. Surveyors used Seaton’s ferry to drill core samples from the river bed. Keller and Gifford ferries: The Keller Ferry links Washington Highway 21 between Lincoln and Ferry counties across Lake Roosevelt, from the south shore at the unincorporated community of Keller to the north shore near the mouth of the San Poil River. About 55 miles upriver, the Gifford-Inchelium Ferry links Gifford on the east shore, about 21 miles south of Kettle Falls, with Inchelium on the west shore. The Keller Ferry is owned and operated by Washington State, which purchased the ferry service from a private operator in 1930. The Gifford-Inchelium Ferry is owned and operated by the Confederated Tribes of the Colville Reservation. Both ferries are free. Kettle Falls: A bridge at Kettle Falls, completed in 1929, replacing a long-standing ferry service. The bridge carries U.S. Highway 2 across the river. Trail: The first bridge across the Columbia in British Columbia carries Highway 38/22A, also called Baily Street. The steel arch bridge was completed in 1961. The bridge is 289.4 meters (949 feet) long. Castlegar: About 16 miles north of Trail, two bridges cross the river at this city. One carries Highway 3, the Crow’s Nest Highway, between Kinnaird, immediately south of Castlegar, and Ootischenia on the east side of the river. The bridge is 365 meters (1,197 feet) long and was completed in 1965. The other bridge, at the north end of Castlegar, connects Castlegar and Robson via Robson Road. The steel girder bridge is 475 meters (1,558 feet) long and was completed in 1994. Arrow Lakes ferries: Three ferries cross the Arrow Lakes between Castlegar and Revelstoke. One is at the junction of the Upper Arrow Lake and Lower Arrow Lake about 12 miles (19 kilometers) south of Nakusp near the community of Arrow Park, which is on the west bank. Another ferry operates between Fauquier on the east and Needles on the west at a point about 37 miles (59 kilometers) south of Nakusp. Both crossings take about five minutes. The third ferry operates between Galena Bay on the east bank and Shelter Bay on the west bank about 20 miles north of Nakusp. The crossing takes about a half hour. All of the ferry crossings are free. Revelstoke: The first road linking the Columbia River east of the Selkirk Mountains with the Columbia River west of the Selkirks was the Big Bend Highway between Donald, near Golden, and Revelstoke in 1929. The road, which followed the river, was completed and officially opened in June 1940. Before 1929, motorists had to ship their cars between Revelstoke and Golden by rail. Canada and the United States ratified the Columbia River Treaty in 1964, authorizing construction of Mica Dam in the Big Bend north of Revelstoke. Kinbasket Reservoir behind the dam would flood the old highway, and so a new route between Revelstoke and Donald and Golden would be needed. The route was the Rogers Pass Highway, now part of the Transcanada Highway, which follows the Canadian Pacific Railway route over the Selkirks. The highway was completed in September 1962 after 12 years of construction. The Transcanada Highway crosses the Columbia River at Revelstoke on a 310-meter (1,016 feet) long suspension bridge completed in 1961. 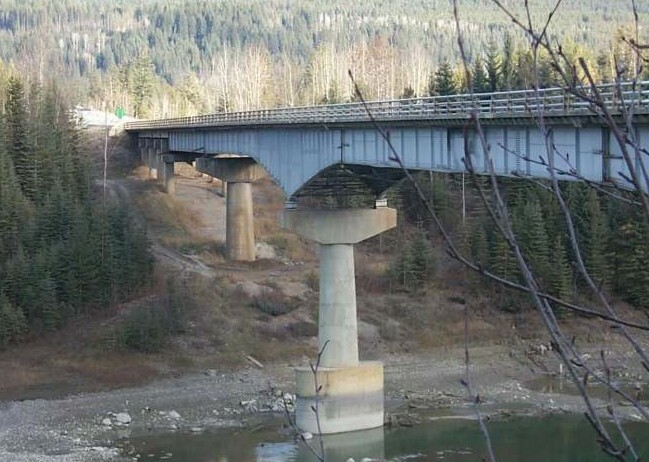 Immediately south of the Transcanada bridge is a Canadian Pacific bridge, and immediately south of that is the old, 329-meter (1,079 feet) Big Eddy Bridge (Wilson Street), so named because it crosses in the area of a bend in the river with that name. That bridge was completed in 1924. Donald: On the east side of the Selkirk Mountains, where the Columbia flows north toward the Big Bend, the Transcanada Highway crosses the river northwest of Golden at a place originally called First Crossing. It was here that the Canadian Pacific Railway first crossed the river, in 1883. 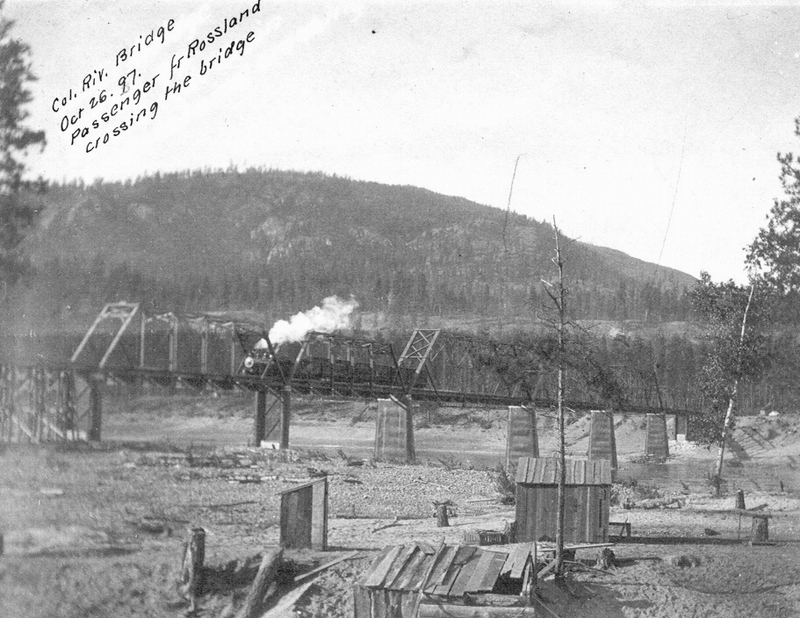 The transcontinental link was completed two years later when crews building toward each other from the east and west met at Craigelatchie west of Revelstoke. The current bridge at Donald is 289 meters (948 feet) long and was completed in 1960. The railroad bridge is just north of the highway bridge. Golden: The city is located at the north end of the Columbia Wetlands at the place where the Kicking Horse River flows into the Columbia from the east. Here, the Columbia River is to the west city. At Golden, a Canadian Pacific spur line from the south connects to the main, east-west line of the railroad. 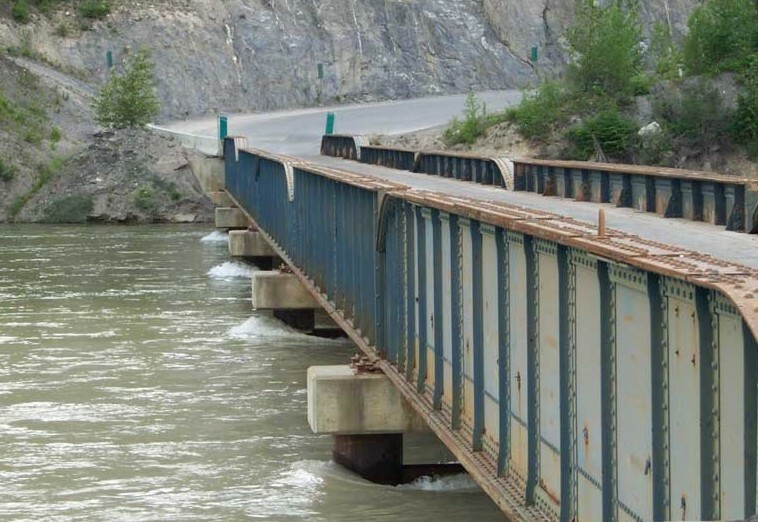 The 102.7 meter (351 feet), one-lane Kicking Horse Drive Bridge, frequently used by tourists, crosses the Columbia on the west side of Golden on the road that goes to the Kicking Horse Mountain Resort, a popular ski area. The bridge was completed in 1983. The settlement of Golden, originally located on a pack trail over the Rockies used by miners and early pioneers, grew as the Canadian Pacific Railway built through the area in the 1880s. Canyon Creek/Nicholson: South of Golden, Canyon Creek flows into the Columbia from the east at Nicholson. The 130-meter (443 feet) bridge over the Columbia completed in 2002. Parson: This unincorporated area along Highway 95 is on the Canadian Pacific Railway spur north of the confluence of Hogranch Creek and the Columbia River. The 100.6-meter (343 feet) bridge over the Columbia was completed in 1975. Spillimacheen: This community on Highway 95 and the Canadian Pacific spur line is at the place where the Spillimacheen River enters the Columbia, from the west. The 106.6-meter (363 feet) bridge over the Columbia was completed in 1997. Botts Channel/Brisco: Two bridges cross the Columbia in the area of the community of Brisco, which is a short distance south of Spillimacheen. One, over Botts Channel, is 45.5 meters (155.1 feet) long and was completed in 1973. Brisco is a small community on Highway 95. The Columbia River bridge at Brisco is 101 meters (344 feet) long and was completed in 1968. 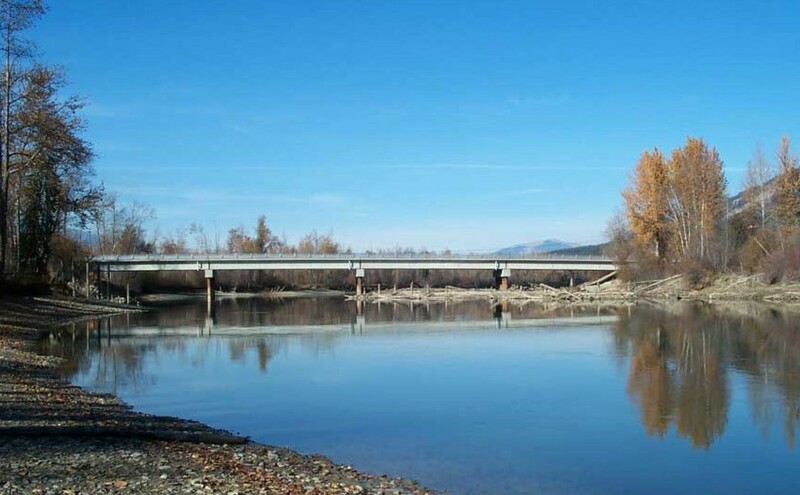 Invermere and Athalmer: A bridge connects Athalmer on the east side of the Columbia River with Invermere on the west side. Invermere is at the northern end of Windermere Lake. The 168-meter (551 feet) bridge, which carries Athalmer Road, was completed in 1987. Fairmont: Here, immediately north of Columbia Lake, the nascent river flows north toward Windermere Lake. The Highway 95/93 bridge is the first — or last, depending one’s perspective — to cross the river, and it also is the shortest of the major highway crossings of the Columbia. The bridge is 48.4 meters (158 feet) long and was completed in 1964. Fairmont Hot Springs resort is just to the east.